CRL: Career Level Enlisted: Sgt., SSgt. CRL: Career Level Officer: CWO2-Capt. CRL: Intermediate Level Enlisted: GySgt.-1st Sgt. CRL: Intermediate Level Officer: CWO4-Lt.Col. CRL: Primary Level Enlisted: Pvt.-Cpl. CRL: Primary Level Officer: WO-1st Lt.
CRL: Senior Level Enlisted: MGySgt., SgtMaj. CRL: Senior Level Officer: Col.-Gen.
All the newest items in the EGA Shop. Check back often! 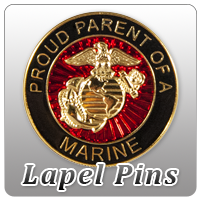 Marine Corps themed clothing, accessories, and decor on clearance. Heritage Pewter has been hand-crafting fine pewter gifts since 1988. Most are made in the USA; some are assembled in the USA. American craftsmanship at it's finest! Support America by buying American made products! Short on time for shopping? Gift certificates are a perfect solution! Click here. Click image to view larger detail. This 16 ounce stainless steel keg mug features a fine pewter casting. The details in this 3-d sculpted design are incredible! Made in USA. Do you own this item? We'd love to hear from you! Click the button to write a review. When you've written five reviews, let us know and we'll send you a coupon for $5 off your next purchase! For security reasons, we do not take orders over the phone. Copyright © 2003-19 MarineParents.com, Inc.